Spectrum imaging (SI) is a method that generates a spatially resolved distribution of electron energy loss spectroscopy (EELS) data. 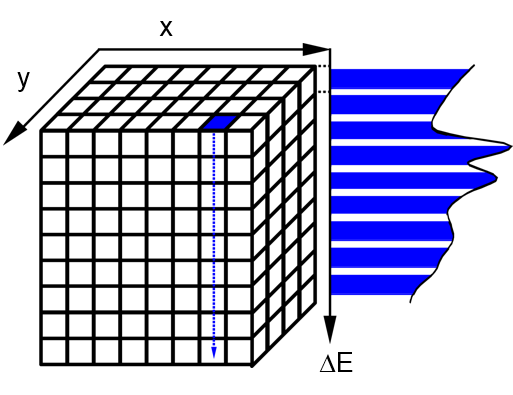 A typical case involves the creation of a data cube where two of the cube axes correspond to spatial information, while the third dimension is the energy loss spectrum. The resultant dataset is known as a spectrum image (or spectrum line scan for the 1D case), which you can acquire and visualize in a number of ways. You can create this data cube either by acquiring a complete spectrum at each spatial pixel (STEM SI) or a complete 2D image collected over a narrow band of energies at a single energy slice of the data cube (EFTEM SI). A spectrum image data cube. The (X,Y) dimensions, while the Z-direction is the energy loss dimension. Vertical columns are spectra, while horizontal planes are energy-filtered images. A key advantage of spectrum imaging is that it allows you to process decisions after acquisition. Having a complete spectrum at each data point allows the creation of quantitative compositional or chemical maps and profiles. The complete spectrum also enables you to identify and correct data artifacts, understand image contrast and dataset limitations. In scanning transmission electron microscopy (STEM), the electron beam is focused into a small probe that scans over the sample to acquire spatial information (X,Y) in a serial manner. In this acquisition mode, you acquire a complete spectrum at each pixel position to build the spectrum image on a spectrum-by-spectrum basis (STEM SI). Alternatively, using a broad parallel beam (e.g., TEM) you can acquire the spectral data image plane-by-image plane while changing the energy of each plane (EFTEM SI). In this mode, you acquire the image in parallel while you obtain the spectrum serially. Once you acquire the spectrum image (either EFTEM SI or STEM SI), you can visualize it either spectrum-by-spectrum (X,Y) or image plane-by-image plane (\(\Delta\)E). The combination of both spectral and spatial information in a single dataset opens up a wide range of data analysis possibilities. You can apply any method to the entire spectrum image dataset that can be applied to a single spectrum to perform spatially resolved spectral analysis. This increase in information provides a powerful tool for materials analysis and characterization.